Spoil your Mom with a special brunch. 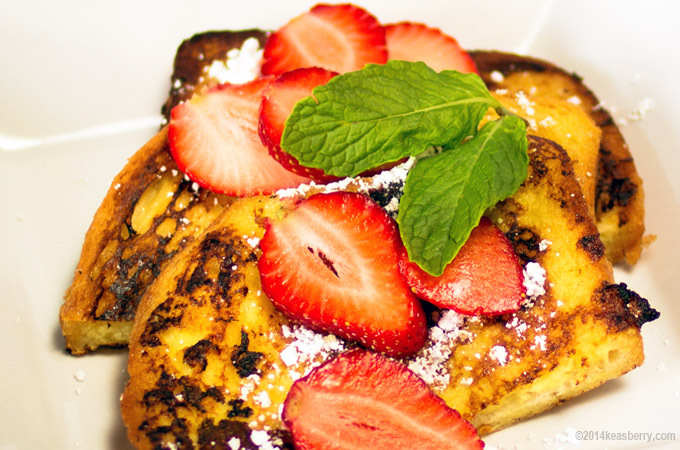 How about some French toast with strawberries and powdered sugar. Add some champagne and orange juice (ingredients for a Memosa) and you are all set to paint a smile on your mother’s face. Beat together milk, eggs, sugar, vanilla, salt in a bowl. Poor the mix in a shallow baking dish. Heat a lightly oiled nonstick frying pan or griddle over medium heat for about 2 minutes. Dunk a few slices of bread in the milk mixture, turn to coat and let the excess drip off. Lay the soaked bread in the pan and cook until both sides are browned. Serve with sliced strawberries and with some powdered sugar.